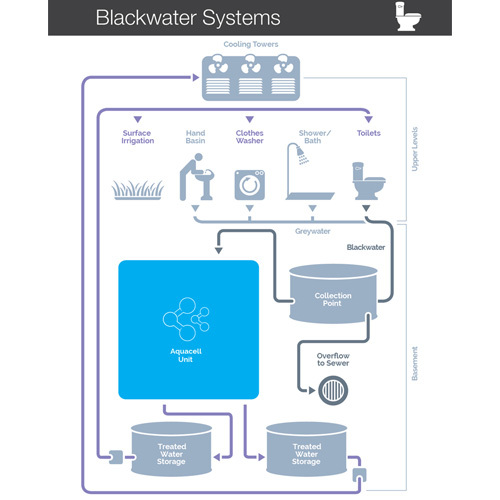 Blackwater is any wastewater that is contaminated with water discharged from a toilet. 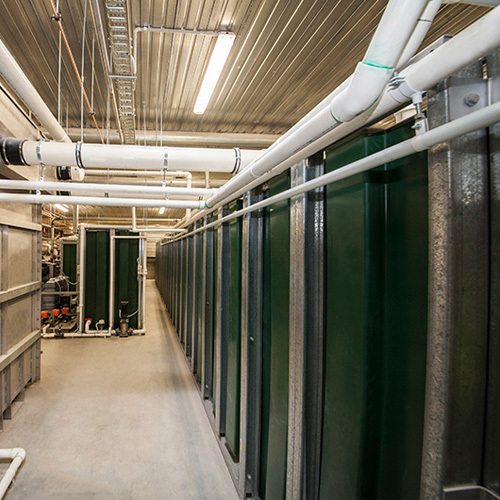 Compared to greywater recycling, blackwater recycling is often more practical since most buildings don’t separate waste streams (greywater from blackwater). Water flows from the property to a collection point. This tank is used to equalize flows. This is where the treatment process begins. The first step efficiently reduces insoluble material to a negligible residue. This residue is either discharged to sewer or it is de-watered and compacted for disposal as solid waste. Air is diffused into the water to create optimum conditions for bacteria to consume impurities. A sustainable biomass concentration is maintained, which metabolizes all incoming waste – resulting in negligible sludge. Ultrafiltration occurs through a special membrane with microscopic pores that prevents particles, bacteria and viruses from passing through. 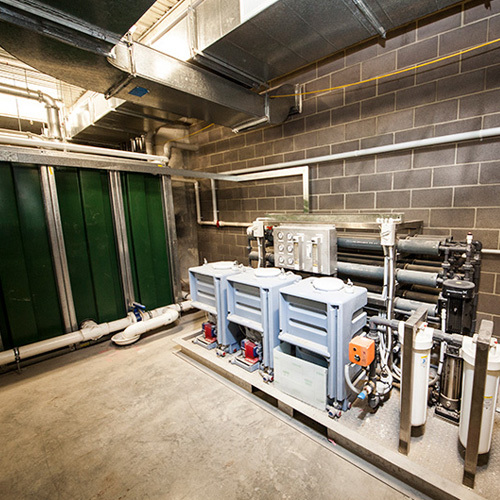 The membranes are air scoured during operation to ensure they remain clean and highly efficient. Ultraviolet disinfection acts to provide additional protection against pathogens. Proprietary technologies are employed for applications such as cooling tower reuse and discharge to sensitive environments. 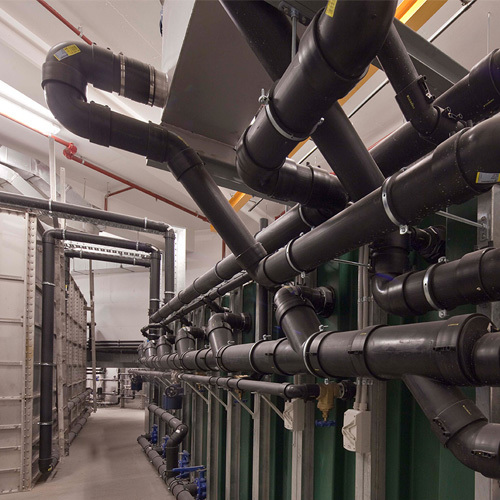 A chlorine residual is added to protect the water while in storage and in distribution. This is the only time any chemicals are used throughout the treatment process. 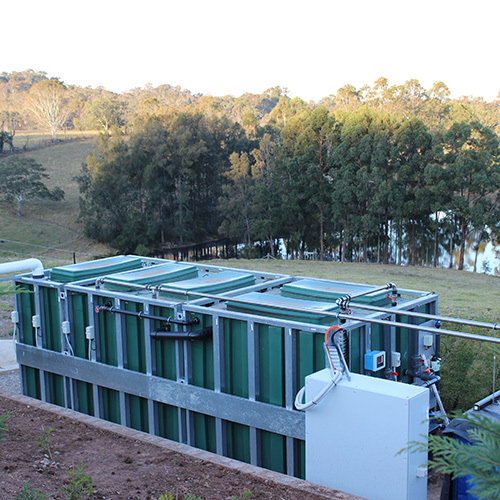 The result is safe water, kept in storage for immediate use in a variety of non-potable applications, including surface irrigation, toilet flushing and cooling towers. With blackwater recycling you can reduce your on-site water usage by up to 90% and take the pressure off sewer infrastructure at the same time. And once your system is installed you’ll have instant access to a never-ending supply of recycled water for all your non-drinking needs. 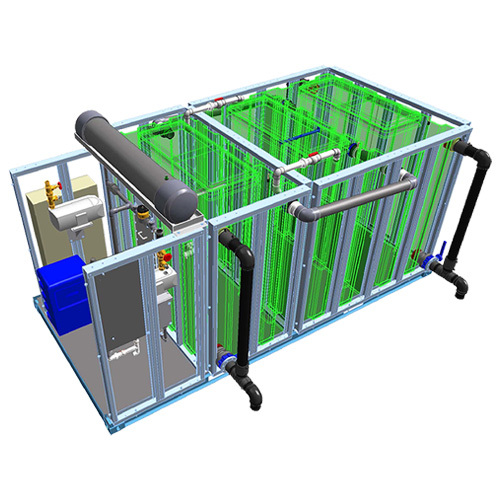 The S series offers the most advanced technology available for on-site wastewater reuse. Systems can be retro-fitted into existing buildings or be installed in new developments.